Congratulations to Amber from Synonym Rolls & Antonym Moments for winning my HearALL Assessment Recorder Giveaway!! I've sent you an email, Amber! CONGRATS!! I'm thinking I might be able to squeeze in ONE more Monday Made-It before school starts back up! There are still so many projects on my to-do list, but at least I'm getting some crossed off! After searching all summer for a monster-themed rug or bathmat with no luck, I decided to just create my own. I purchased the round green rug from the bath section at Target for $9.99, cut the facial features from felt and used fabric glue to apply them. I'm going to put it in front of my classroom sink. I bought these little containers and tried it. It worked, but the shaking noise bothered me. Not bad when only a couple were going, but when a DOZEN were shaking...annoying! Well, my sweet friend and co-worker, Kristen at Bless Your Heart found the neatest containers to use for this. They were so cute that I really wanted to give it another try. So, I went to Target and grabbed some of the containers she used (from the Dollar Bin - holla! )...they're PERFECT with the clear top, don't you think? But the noise would still be a problem...hmmm....a little felt and hot glue and problem solved! I think they might be the most perfect little dice shakers ever. You know why? I haven't even told you the best part yet! They're magnetic!! 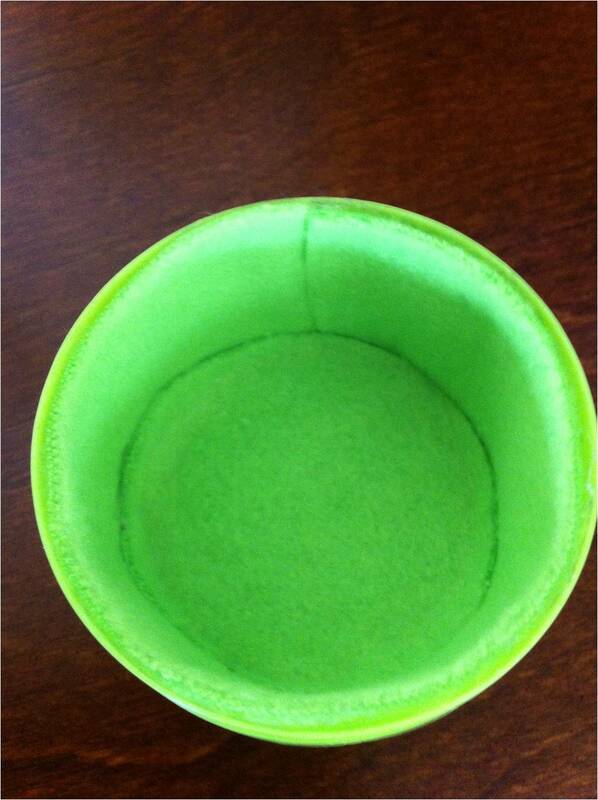 The entire bottom of the container is a magnet! So, now I don't even have to pass out the dice EVERY.TIME we play a math game. I took a cookie sheet, used Elmer's spray adhesive to attach fabric to it, mod podged it, and voila! I'll just hang it in the classroom and the kids can walk by and grab a shaker whenever they need dice! **Update** If you use FOAM dice, you wouldn't even need to line these with felt! How easy would THAT be? Dollar Tree has packs of foam blocks (50) right now that you could draw dots on to create dice! I had another pan that I had already purchased (these were from a project-gone-wrong), so I created a magnetic note board to put behind my desk. It's just fabric mod-podged to the pan! Plus, I wanted to practice using my new Cameo and needed to put letters somewhere! :) The note on it is from my husband...actually he said to "Run!" Don't judge on this one! This was the VERY FIRST thing I did with my new Silhouette Cameo. Why in the world did I not practice first? Why did I start with something ROUND? And, why did I not wait for my bright, fun colored vinyl to arrive? Live and learn. I still think the kiddos will like the idea of this and I had to cover up the "Jelly Belly" label on the machine. I know, I know...you saw this one already, but LOOK! I added polka dots with my Cameo! Since my bright vinyl hasn't arrived, I used a SHEET of duct tape. Did you know they sell duct tape by the sheet?? And, this was an easy one, but since I'm going to implement Whole-Brain Teaching, I picked up a whiteboard to use as my Scoreboard. I used duct tape and my Cameo to give it some red and turquoise touches to match the rest of my classroom! I like that it's small and has a pen attached so I can carry it all around the room with me. Headed up to my classroom for a bit now...I hope to have the big reveal this week! Love all your creations. Too Cute! So many great ideas. I think your monster rug is stinkin' adorable! Love, love, love it! You are quite the crafty gal! I'm in love with the dice set up! Actually all your projects are super cute as usual. WOW, you've been busy! I love all of your Monday Made Its! The rug and trash can are ADORABLE, sometimes it is just easier to DIY than search and find something that just doesn't fit! The dice container will be a *life saver* and for some reason students think they are much cooler than actual dice. I have one container of fancy dice as an incentive to get ready. I love the eraser jar. How cute will that be next to your pencils?! I swear kids eat those things!!! 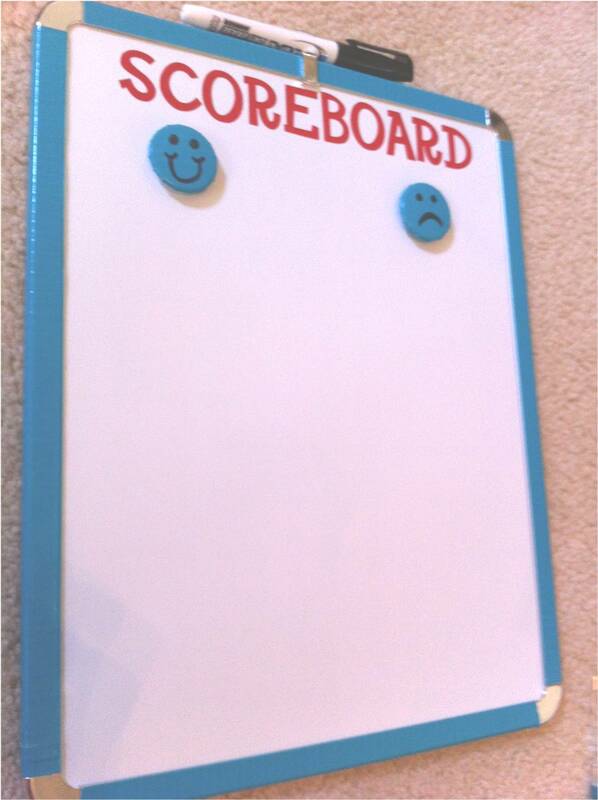 You are BRAVE to attempt your first Cameo experience on a round surface! At least you can take it off and try again if you really just can't stand it. Where did you end up ordering your vinyl from? I have a cricut and love to cut vinyl except I have only been able to find black and brown. I love all of your projects. You are so crafty! I think your Target Dollar Bins are cooler than mine! 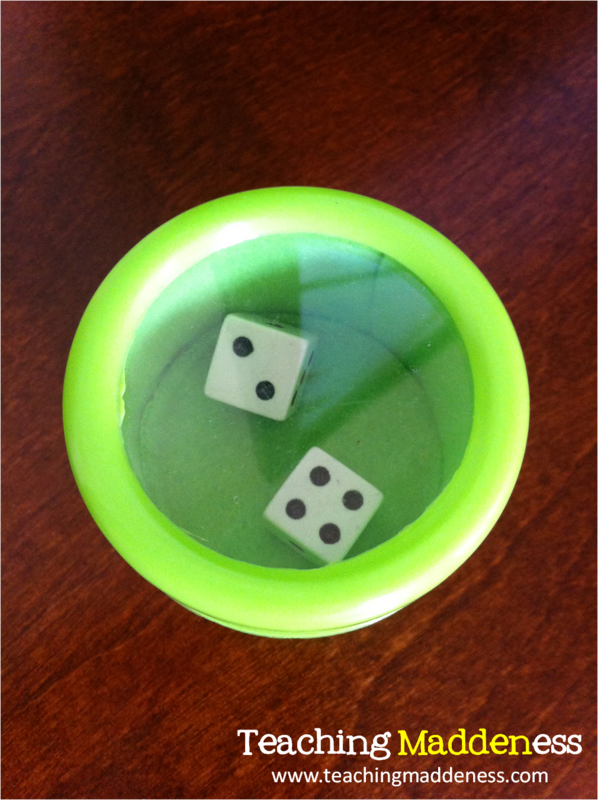 I don't remember ever seeing those adorable containers for dice! Now I have to go back and look today! On my goodness! I love those dice containers! How clever ARE YOU!!! Thank you for linking up your talents!!! Love the dice idea. I've actually been toying with that one a bit, but was afraid of the noise, too. Felt!! Brilliant. Thanks for the idea. Love the dice! I've also been looking for the straw dispensers. Maybe Amazon is the way to go! Look forward to seeing it next week! Your projects came out great. I love that monster rug! I love EVERYTHING you made this week!!! 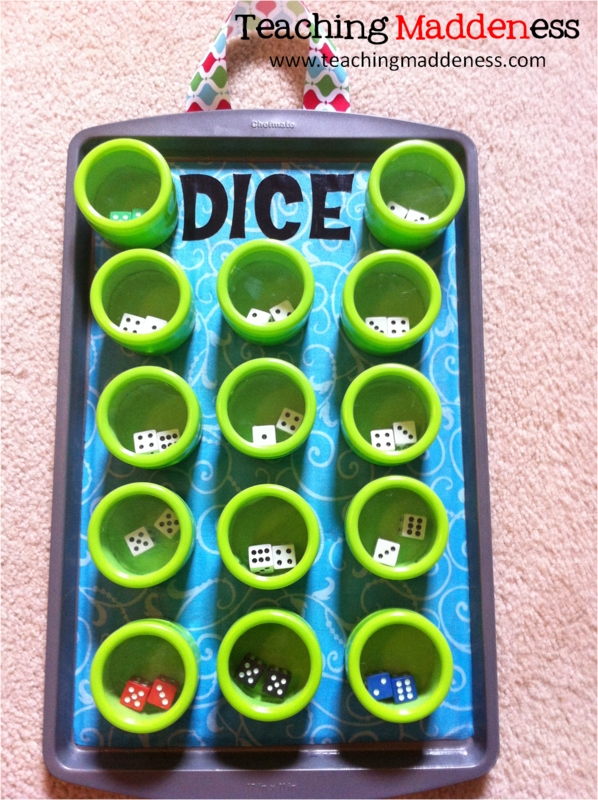 What a great idea for the dice!! I don't even know where to start! Thanks, again, for having the giveaway...I am SOOO excited:D And, wow, everything looks so great! That monster rug is the best:) You are uber talented, lady! Love all your creations - especially your monster rug and your dice shakers! You are seriously SOOOO CUTE and inspiring! I love the bath mat! I love the erasers in the gum ball machine. I love everything!!!! The rug you made is beautiful. It looks very professional and you should totally make more and sell them! I love it all. 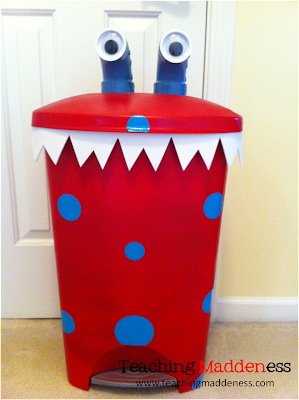 The monster rug and trash can are darling. I want to make a magnetic note holder. Yours is so stylish. I am so doing that for my dice!! Thanks for sharing!! Your monster theme is really turning our fantastic because you are so creative. I can't wait to see your classroom all pulled together. 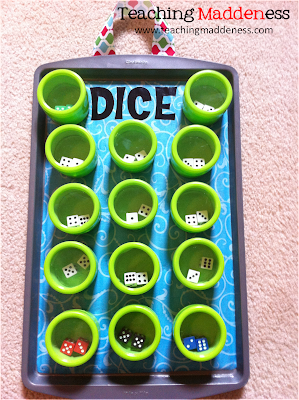 I just pinned your dice idea. . .LOVE IT!!! Love the dice conversion!! I actually just asked a local daycare baby room to save the larger plastic baby food containers for me. 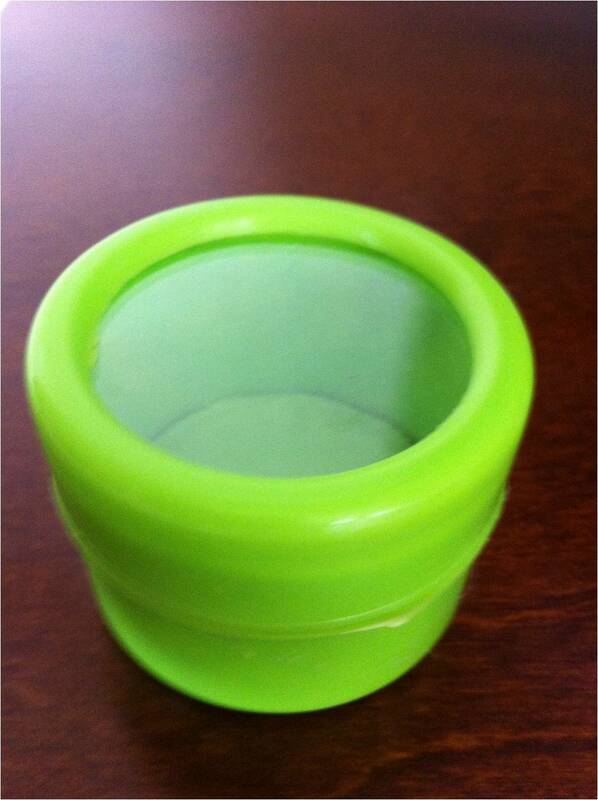 Clear container and free!!!! The noise isn't too bad for me--or I am just really good at ignoring. Also I do sets of two dice for addition! Love thinking outside of typical item usage!! Your monster rug is sooooo cute!! I CAN NOT WAIT to see your reveal!! I hope to have my reveal next week as well!! YAY!! 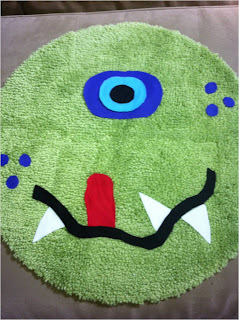 Your monster rug is beyond adorable!! Your dice shakers could not have turned out more perfect! Pinning! I love the way your dice board came out. I made quiet dice shakers for my Monday Made It too. Great minds think alike. I love everything you made!! So cute and creative!! You've been VERY busy -- and it's all SOOOO cute! The dice shakers are absolutely brilliant! You've given me new hope for some slightly rusted metal pans. I have fabric and mod podge.... Time to get busy! Thanks for sharing your creations! 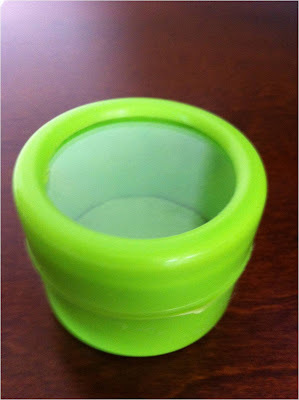 Totally off topic BUT I have been looking for one of those straw dispensers (for pencils in the classroom) and I found this link: http://teacherificfun.blogspot.com/2012/08/monday-made-it-and-winner.html. Thought you might be interested since you had mentioned you were also trying to find one ! Love the dice containers/storage. I guess I will be off to Target tomorrow! LOVE IT!! All of your creations from this week are amazing! The monster themed stuff that you've made is super cute! Amanda...SOOOO CUTE!!! I especially love your dice board! Genius!! I'm in LOVE with your magnetic dice containers! Love the dice tray! I have noise issues too! I'm worried about your too cute for words rug...will you scotch guard it before you put it down? Inquiering(sp) minds want to know! WOW!!! You have the best Monday Made It this week!!! I love love love your monster rug, monster trashcan, dice shakers, and your WBT board!!! Such great ideas!! Wow! You've been busy! I'm still need to order some vinyl...I haven't taken on any big projects, but plan on doing something tomorrow! You make me wish I had a monster theme! So cute! I love it all. I am so excited to get my Cameo and try to do some fun things with it like you have. Thanks for the inspiration! I am your newest follower! Your monster rug is too cute! I seriously just added six more things to my to-do list!! You are so talented! I hope I can do them without a cameo. I had no idea you could Mod Podge to metal. Amanda I love, love, love all of your creations. 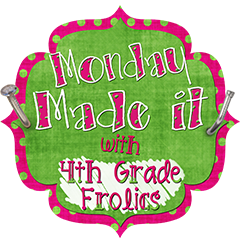 Your Marvelous Monsters are going to Love being in your class. Caroline is a little jealous! The rug is beyond adorable! 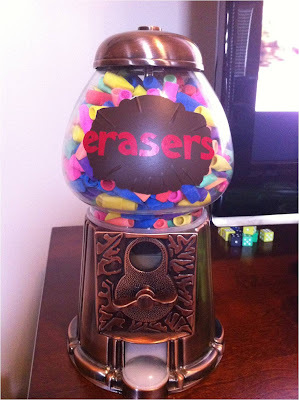 So, does the gumball/eraser machine actually work? Do you put in coins? Do the erasers come out without getting stuck? Everything you made is so cute! I'm going to have to poke around some more! I love your monster theme and the rug you created! Your monster rug and trashcan are so stinking cute!!!! All of your projects are so very cool....just really love the monster items!! As I was strolling through Target today I saw these containers! Of course I got 8 of them... :) Thanks for the idea! You are so stinking creative! Love these! Loved your ideas so much you inspired me! I gave you a shout out on my blog. I hope you don't mind me stealing your fabric on cookie sheets idea. Where did you get the bubblegum machine for your erasers? So cute!!!! :) I'm LOVING your monster theme! Your dice containers are ALL over Pinterest!! LOVE LOVE LOVE them! Amanda- I LOVE, LOVE, LOVE all this stuff...I so wish I could whip across town and come visit your classroom! I bet it looks amazing! I am going to Target first thing tomorrow and look for those containers..you said they were in the Dollar Spot, right! Thanks also for being a guest blogger over at my blog. 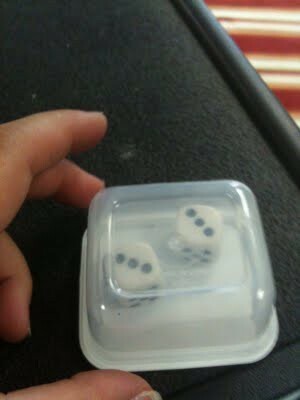 I think my readers will love the freebies and the math book ideas...and how can they not LOVE these dice containers!!! Wow! There are so many clever ideas featured in this post. The monster theme is fantastic and you did a wonderful job on the rug and trashcan! Hello! 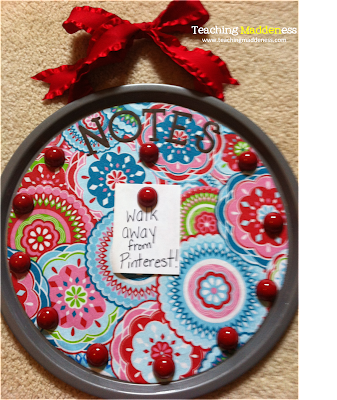 I recently found your post on Pintrest and then got a gumball machine. Mine is sticking horribly. The erasers never seem to come out right on the first try. How do you keep yours running smoothly?